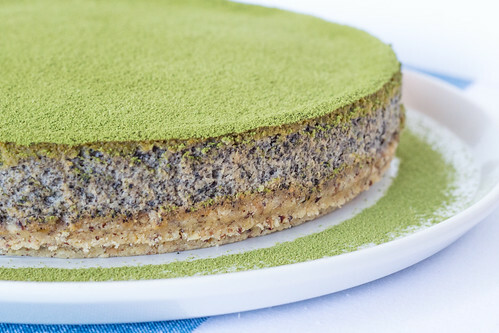 Green Tea & Black Sesame Cheesecake | ohdenny. This is one of my favourite baked cheesecake recipes. 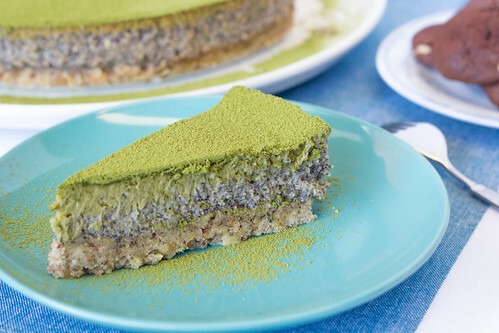 It has a crunchy hazelnut base, a layer of black sesame filling, a layer of green tea filling, a green tea powder on top and it doesn’t feel very rich like some cheesecakes are. 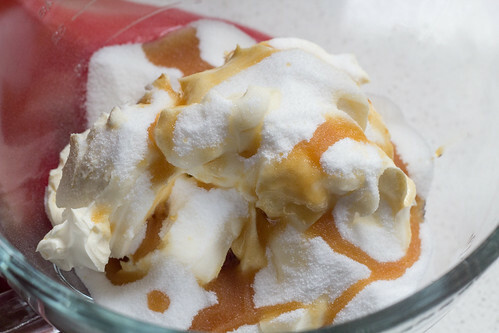 I’m so glad I found this recipe on Oh Sweet Day, who has some amazing looking recipes that I can’t wait to try too. 1. Preheat oven to 175°C. Grease and line an 8-inch spring form pan. 2. 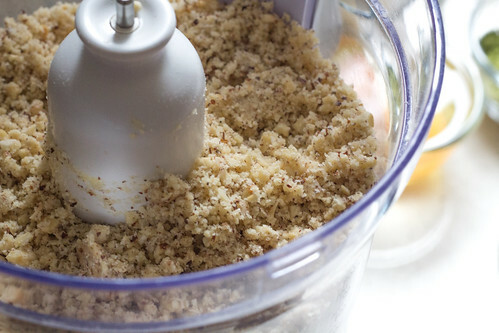 Roughly chop the hazelnuts and then add to the food processor. 3. 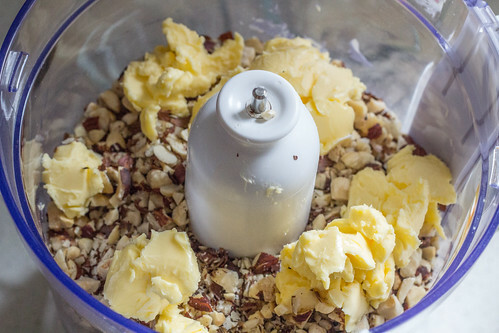 Place the unsalted butter, plain flour, caster sugar and salt into the food processor with the hazelnuts. 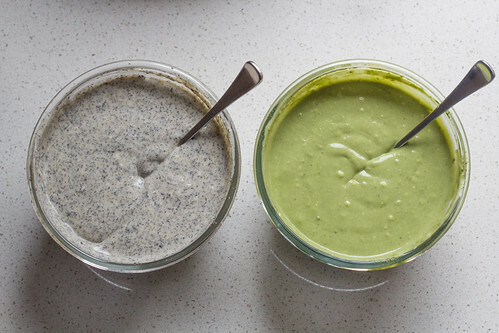 Blend until the mixture resembles coarse meal. 4. Place the crust mixture into the lined spring form pan and press the mixture onto the bottom of the pan so it is all combined. Bake the crust for 15 to 18 minutes or until just browned. Set aside to cool. Turn the oven temperature down to 145°C. 5. 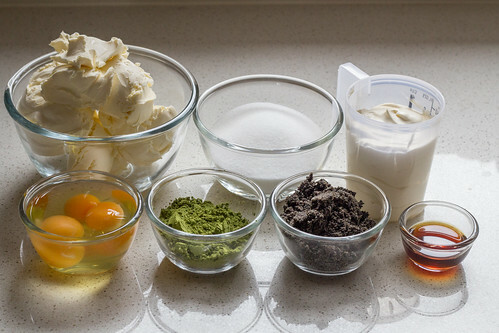 In a standing mixer, mix the cream cheese, sour cream, caster sugar, vanilla extra until combined. 6. Add in the eggs one at a time. Mixing until just combined before adding the next egg. Blend for another 2 minutes until well combined. 7. 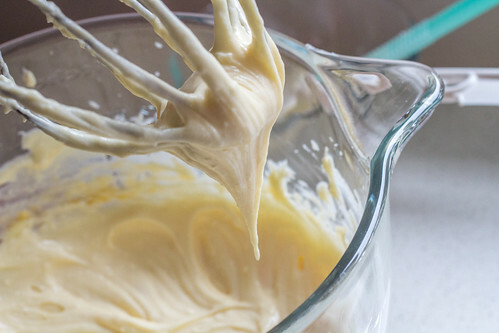 Divide the batter into two equal portions. 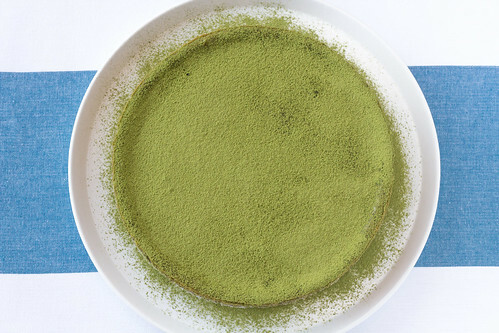 Add two tablespoons of the matcha green tea powder to one and black sesame powder to the other. Mix until well combined. 8. Pour the black sesame batter into the pan. Then pour the green tea batter on top. 9. Position the rack in the centre of the oven and place the cheesecake on it. In a shallow pan, fill it with water and place it on the lower rack in the oven. Bake for an hour, or until the edges of the cheesecake are puffed but the centre is wobbly and wet looking. Turn off the oven with the door slightly ajar and leave the cheesecake in the oven to cool completely. This may take at least an hour. Remove from the oven and chill in the fridge overnight. 10. 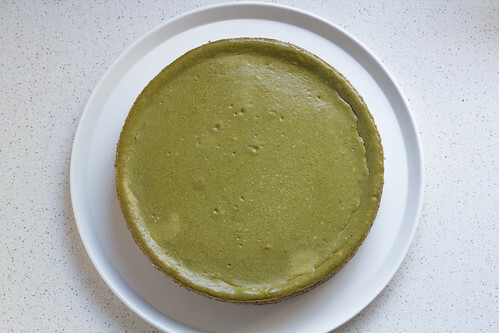 Dust the remaining matcha green tea powder on top of the cheesecake just before serving. Preheat oven to 175°C. Grease and line an 8-inch spring form pan. 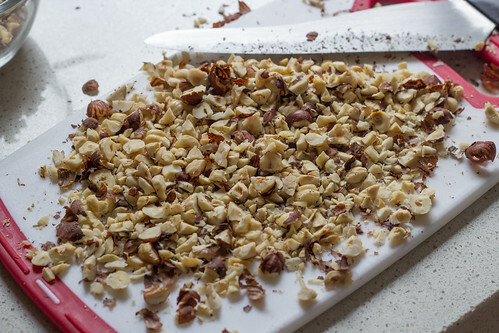 Roughly chop the hazelnuts and then add to the food processor. 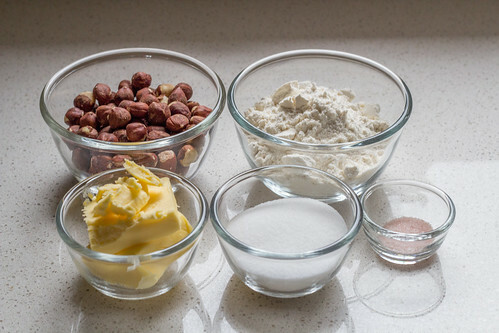 Place the unsalted butter, plain flour, caster sugar and salt into the food processor with the hazelnuts. 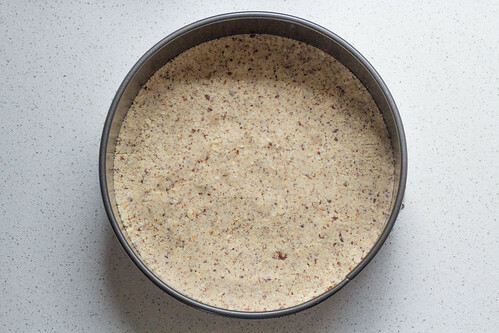 Blend until the mixture resembles coarse meal. 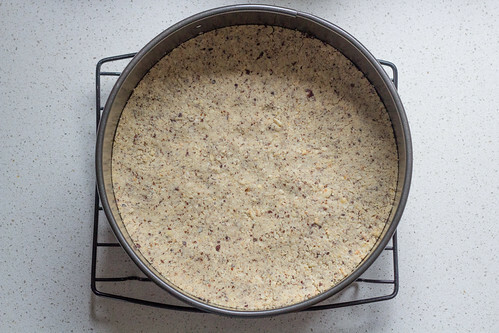 Place the crust mixture into the lined spring form pan and press the mixture onto the bottom of the pan so it is all combined. Bake the crust for 15 to 18 minutes or until just browned. Set aside to cool. Turn the oven temperature down to 145°C. 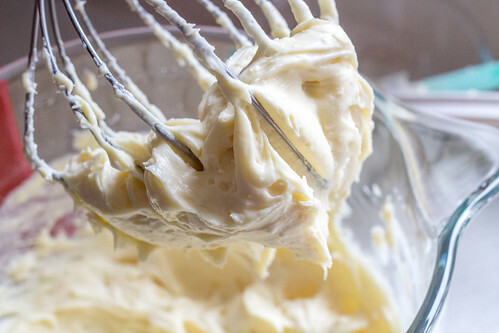 In a standing mixer, mix the cream cheese, sour cream, caster sugar, vanilla extra until combined. Add in the eggs one at a time. Mixing until just combined before adding the next egg. Blend for another 2 minutes until well combined. 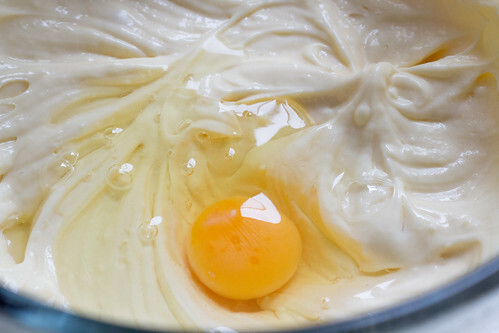 Divide the batter into two equal portions. 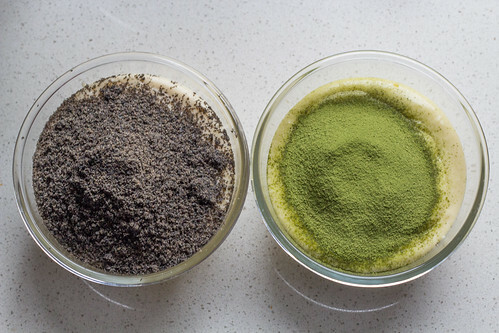 Add two tablespoons of the matcha green tea powder to one and black sesame powder to the other. Mix until well combined. Pour the black sesame batter into the pan. Then pour the green tea batter on top. Position the rack in the centre of the oven and place the cheesecake on it. In a shallow pan, fill it with water and place it on the lower rack in the oven. Bake for an hour, or until the edges of the cheesecake are puffed but the centre is wobbly and wet looking. Turn off the oven with the door slightly ajar and leave the cheesecake in the oven to cool completely. This may take at least an hour. Remove from the oven and chill in the fridge overnight. 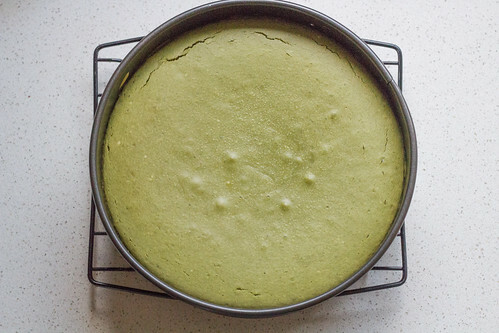 Dust the remaining matcha green tea powder on top of the cheesecake just before serving. 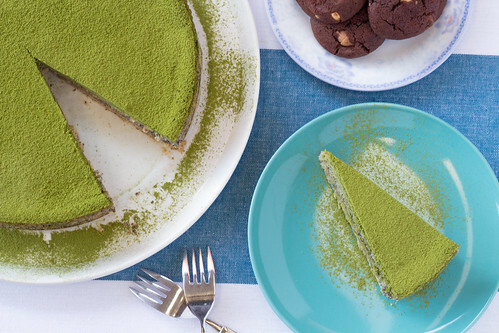 Instead of pouring the green tea batter on top of the black sesame layer. 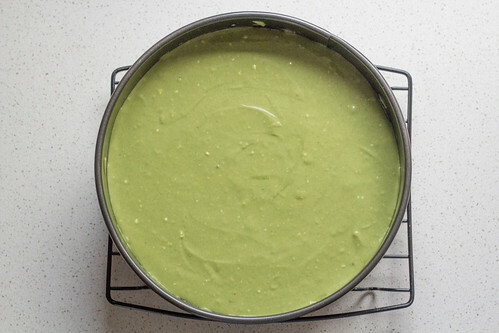 You can try dolloping the green tea mixture and use a knife to swirl the green tea around.